Katherine Elizabeth Repp was born on November 5, 1871 and her future husband, Ludwig Müller, was born in the same village of Norka, Russia three days later on November 8th. Katherine was the daughter of Heinrich Repp and Margaretha Fink. Ludwig was the son of Johannes Müller and Elisabeth Helzer. Shortly before his 21st birthday, Ludwig decided to leave Russia and make a new life for himself in America. He departed from the port of Hamburg, Germany on June 3, 1892 aboard the steamship Normannia and arrived in New York on June 13, 1892. He was unmarried at the time and traveling with a group of people from Norka. Katherine arrived in the United States in 1891 with her parents and five siblings according to the Ebenezer German Congregational Church records. Katherine was a first cousin of noted humanitarian, George Repp, whose family had immigrated in 1886 and settled in Portland about 1890. It's likely that Katherine's father and uncle Konrad coordinated their reunion in Portland. 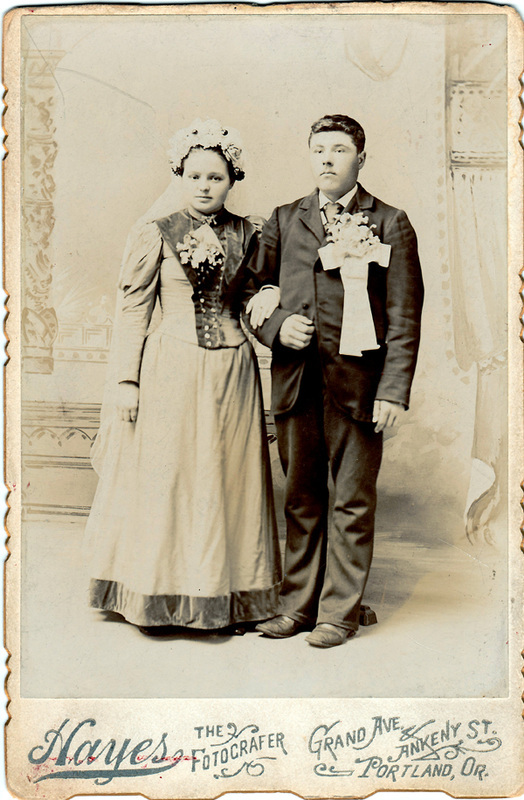 Ludwig and Katherine were married in the Ebenezer German Congregational Church in Portland, Oregon on February 11, 1893 by Pastor Edmond Grieb. Katherine Elizabeth Repp and Ludwig Miller wedding photograph courtesy of Shanna Minarik. The 1900 U.S. Census shows the Miller family (surname changed to a more Anglicized spelling) living at 790 8th Street, next to Henry and Margaret Repp family - Katherine's parents. The Miller's had five children, all born in Portland: Christina (born August 6, 1894); Elizabeth (born October 10, 1896); Henry (born September 10, 1898); Anna Maria or Emma (born July 10, 1900); Mary Margaret (born May 2, 1902). After his arrival in Portland, Ludwig initially worked as a laborer, but he clearly had the spirit of an entrepreneur. 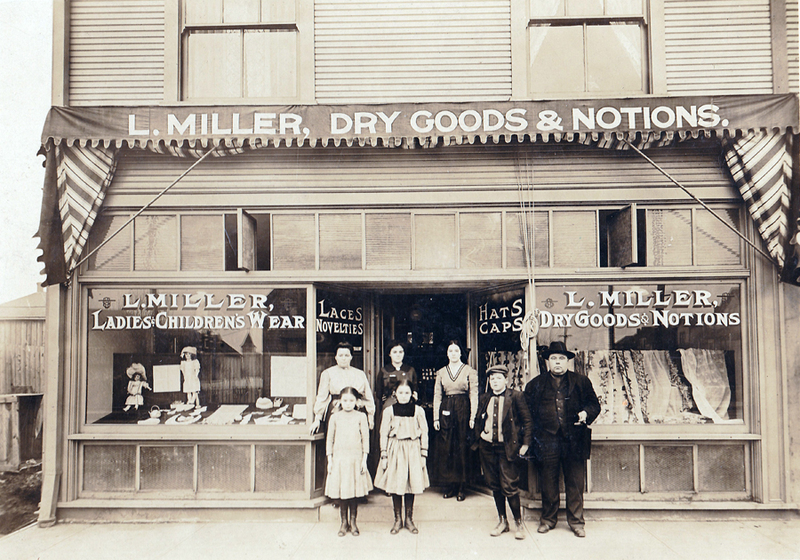 About 1908, Ludwig opened the L. Miller Dry Goods & Notions store which was located at Union Avenue and Fremont Street. The Ludwig Miller family portrait in front of the L. Miller Dry Goods & Notions store circa 1908. Back row from left to right: Katherine, Christina and Elizabeth. Front row from left to right: Anna Maria, Mary, Henry and Ludwig. Photograph courtesy of Shanna Minarik. The 1909 Portland City Directory shows Ludwig working as a bartender for a cousin, Heinrich J. Helzer (born in Norka on April 17, 1870). After learning the business, Ludwig established his own saloon located at 740 Union Avenue (at the intersection with Fargo Street) beginning about 1910. By the time the 1910 census was taken, the family had moved to 800 Grand Avenue North. 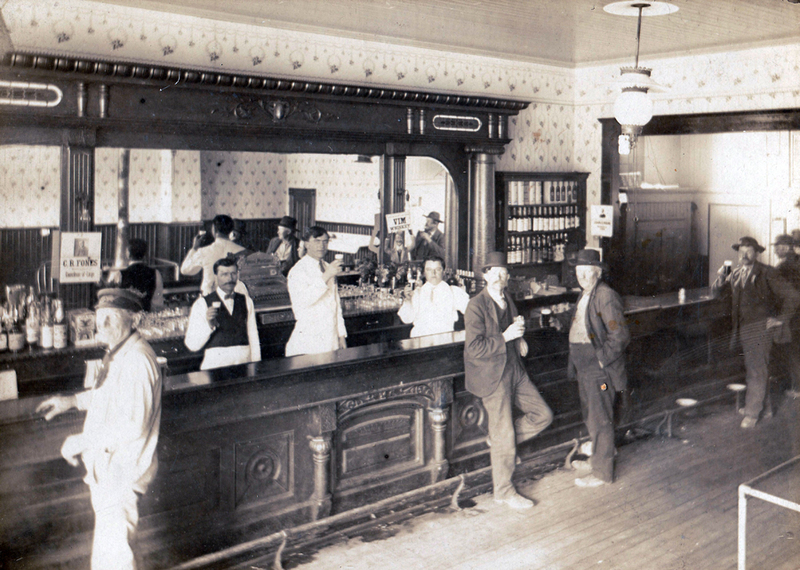 The Ludwig Miller Saloon circa 1913. The tall man behind the bar is Henry Yost, Ludwig's son-in-law who was married to Christina. The shorter bartender with a mustache is believed to be John Repp, a relation through Ludwig's maternal family. The young man standing to the right behind the bar is likely to be Ludwig Miller's son, Henry Miller. Photograph courtesy of Shanna Minarik. Ludwig died in 1913 at the age of 42 and was buried at the Rose City Cemetery in Portland. Katherine's parents, who died after Ludwig, are buried with him. Katherine remarried another widower from Norka, Conrad Bauer, on June 24, 1919. Shanna Minarik (née Bauer), great-great-granddaughter of Ludwig and Katherine Miller. U.S. Census Records and Portland City Directories from Ancestry.com. Andersen/Bauer Family History by Jean Bauer Anderson, 1992. ​Last updated August 3, 2017.